Top model of the Aventour line. Its unique lid with integrated locking mechanism can be opened and closed with one hand. The waterproof map- and tablet case can be folded into several different formats (up to 24x24cm) and allows flexible positioning on top of the lid. 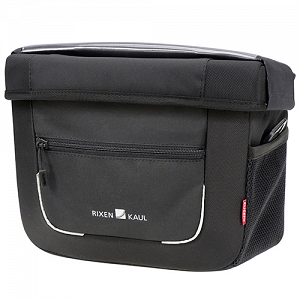 The case’s Velcro fixation encompasses the lid on two sides, resulting in an extremely stable and secure fit. The bag comes equipped with reflectors, a front pocket with rain cover, 2 mesh pockets, shoulder strap, 3 inner pockets and a document compartment.